When water leaks or spills occur indoors – ACT QUICKLY. If wet or damp materials or areas are dried 24-48 hours after a leak or spill happens, in most cases black mold will not grow. Mold Growth on Floor Joist Caused by Water Damage. Burst pipes and other type of water damage is a frustrating experience for property owners. For an insured homeowner, restoring your home after water damage is a frustrating experience. Fortunately, natural disasters don’t occur every day, and chances are you’ll never have to deal with water damage from rising water or flooding. 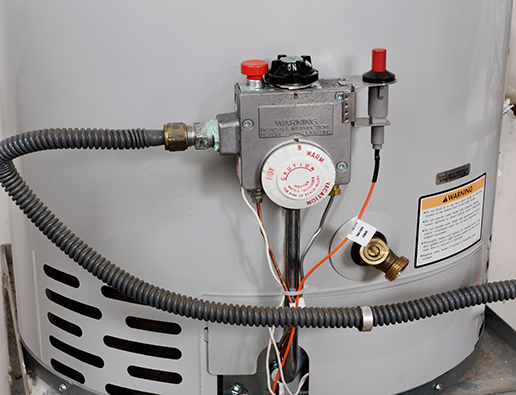 However, simple plumbing leaks or overflows are far more common. While dealing with water damage may seem fairly simple (mop or wet vacuum; fans used to promote evaporation), unfortunately, this fails to consider the degree to which water can penetrate into structural cavities and assemblies, creating trapped pockets of saturation. 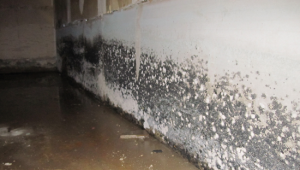 Too late, property owners become aware of the on-going effect of this trapped water on structural and contents materials, which may include: discoloration, warping, splitting, delamination, and musty odor and black mold growth. The consequences of ineffective restoration – including possible health effects – are far too great to leave water damage improperly restored. 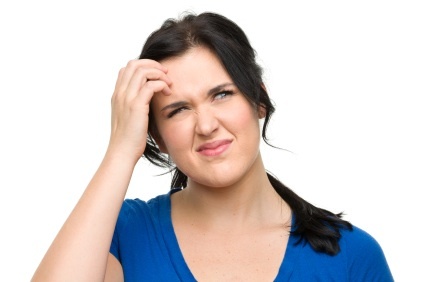 Most property owners are not familiar with the essential steps and tactics for proper restoration, and naturally, they have a lot of questions. That’s where the certified water restoration professional comes in. He or she will be qualified through formal training and experience to remove excess water efficiently, to promote efficient evaporation and to establish the dehumidification conditions necessary to stop on-going damage. Moreover, they can document the return of your property and contents to normal conditions to ensure that future problems will not be experienced. Black Mold on Garage Wall. 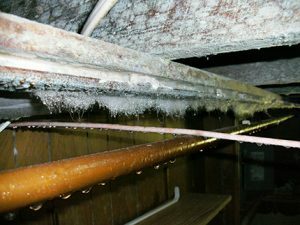 Mold becomes a problem inside a home or business when there’s excessive humidity or moisture for an extended period of time. The problem can originate from sudden water releases, like a burst pipe or large spill that goes untreated, or from a chronic condition, such as a leaking roof or plumbing. Even high humidity or warm, moist air condensing on cool surfaces can trigger mold problems. It’s always best to have the mold evaluated and removed by a certified professional, like Single Source. Mold can grow almost anywhere if conditions permit. If there is visible growth on painted wall surfaces, property owners should be concerned about what may be growing on the wall’s opposite side.The environment inside the walls of a house often differs drastically from the outside and could create a perfect haven for mold. If the wall remains wet for a prolonged period, it’s almost guaranteed that the mold growth on the back side will be worse than on the front. At that point, containing the work space and removing moldy materials, followed by cleaning of salvageable framing, are the best options.